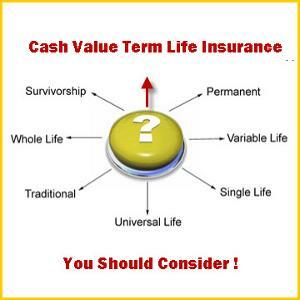 Why you may want Cash Value Term Life Insurance? • The mortgage that was supposed to be paid off by then was re-financed three or four times and the final payment date pushed out several more years in the process. • Two of the kids who were supposed to be on their own by now are still going to college, including one son whose school is considering naming his dorm room in his honor. • The good news is your daughter did graduate. The bad news is she recently moved back home and is bugging her parents to re-model the basement - because she needs more space! • Retirement was supposed to be around the corner by now. But a suspension of their payroll deduction (which lasted longer than intended), plus an unplanned market meltdown combined to make their 403(b) statement look more like a checking account balance. Add in the constant threats by their state legislature to cut back on postretirement benefits, and that dream of a comfortable retirement seems pretty far off. • At that point, you would realize you are going to need to keep that life insurance coverage you bought for at least several more years - at which time you receive a bill for year 21 on their traditional term policy and find you premium is going up over 1,000%. Unlike traditional term, Cash Value Term has the flexibility to deal with life's unexpected twists and turns. With yearly renewable term (YRT) rates at the end of the level period as little as 30% of those in traditional level term, extending coverage is much more affordable. Alternatively, the reduced paid-up option can provide for the continuation of up to 50% of the initial death benefit with no further premium required. And if you’re lucky enough to have everything work out as planned, and you no longer need coverage, you can get a nice lump sum payment of your cash value to make that retirement just a little more comfortable. So why should you consider the advantages of Cash Value Term? Because, sometimes life doesn't quite go as planned.